100% anti-magnetic, corrosion-resistant, lightweight and strong, titanium alloy is ideal for biological and medical applications. Titanium has the tensile strength of carbon steel and is completely resistant to corrosion from nitric acid, chloride, salt water, and industrial and organic chemicals. Titanium surgical instruments are more flexible and 40% lighter than Inox. 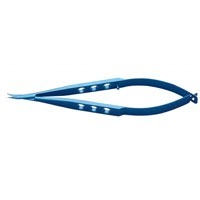 This reduces hand fatigue during long procedures. When heated or cooled, the dimensions of titanium alloy change less than half of what stainless steel alloys will, making titanium surgical instruments much more durable. Titanium is stain-free and temperature resistant up to 430°C. Titanium instruments are the premium choice for corrosive environments or MRI applications. Titanium surgical instruments are 40% lighter than stainless steel. They also last longer than stainless steel instruments.